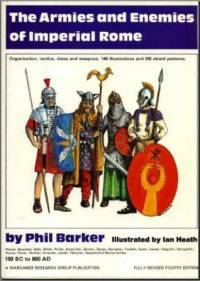 The Armies and Enemies of Imperial Rome spans the period from 150 BC to 600 AD and describes the forces of the later Roman Republic and the Byzantine wars as well as the armies of the heyday of the Roman Empire. Coverage of Rome's enemies includes Gallic, British, Pictish, Scots/Irish, German, Dacian, Sarmatian, Frankish, Saxon, Vandal, Visigothic, Ostrogothic, Hunnic, Pontic, Parthian, Armenian, Jewish, Palmyran, Sassanid and Blemye armies. It examines tactics and strategy, organisation and formations and orders of battle as well as providing a detailed guide to the dress and equipment of the armies of the period. Comprehensive illustrations by Ian Heath complement Phil Barker's text and the result is a wealth of information for anyone interested in the warfare of the time. Long out of print, the book has been a source of inspiration to wargamers and academic historians alike. It is reprinted here in its complete 1981 fourth edition with an updated bibliography.